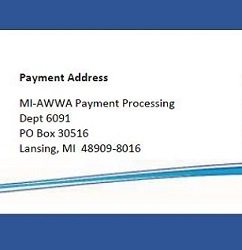 Welcome to the Michigan Section of the American Water Works Association. The Section is a community of water professionals dedicated to treating, delivering, and protecting clean, safe water for Michigan communities. Check out the Resources tab in the top menu above for information on the Lead & Copper Rule and PFAS. Download our new Training Catalog. Then, to register for any class, visit the Calendar of events. Or you may register by using the downloadable registration form. Having trouble? Contact staff at 517-292-2912.